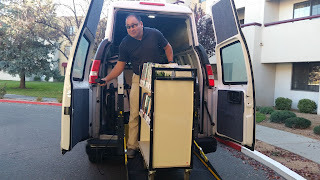 Recently, we were able to take a ridealong in the Public Library's Book Van. What is the Book Van, you ask? 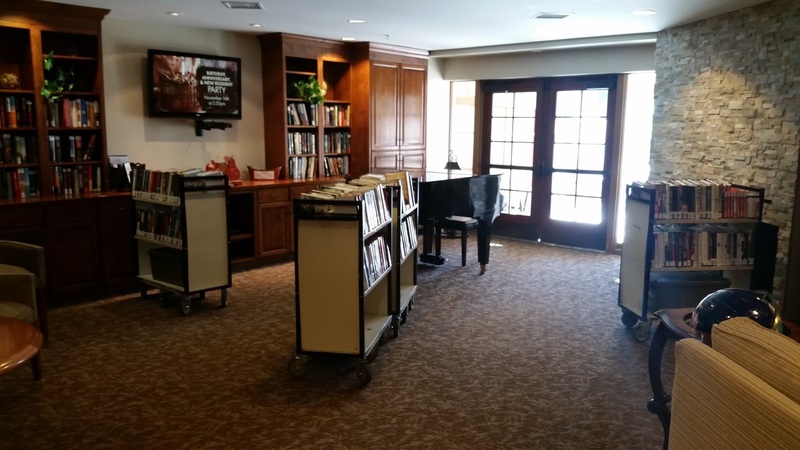 The Book Van provides free public library service to senior living facilities whose residents cannot easily access neighborhood branch libraries. It has been active since 2001, when it was bought with funds raised by Friends For the Public Library. The Book Van has a list of sixteen facilities which it delivers to, stopping at most once every three weeks. It makes deliveries three days a week, going to two locations a day, one in the morning and one in the afternoon, stopping for about an hour in each location. The Book Van is now loaning DVDs, Playaways, and books on CD as well as books, and tries to get books for residents in Spanish as requested. 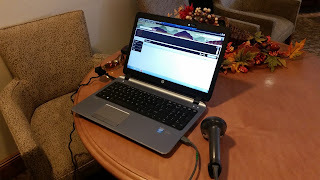 Once set up in the common room of the facility, a mobile hotspot is used to connect to the library so that its two staff members can make library cards, check-in, check-out, and place holds. They also answer questions on a variety of topics, including helping residents with their Kindles. Before the delivery day begins, staff members must get the Book Van ready, assembling holds and refreshing the materials to be loaded on for the day's stops. The van is custom-made with a special frame to hold four book trucks, three for fiction titles and one for non-fiction. They also have a bin for returns and a bin for holds which have been placed for the residents. New books are added to the mix as needed - there are around 600 titles available to the Book Van at any given time, with the emphasis on current and high demand adult fiction and large print materials. 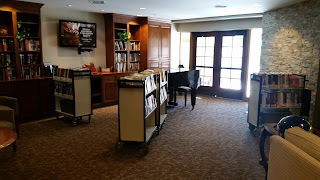 If you know someone at a senior living facility, have them check if the Book Van stops there so they can take advantage of this great resource! If your senior is not at one of the stops listed, the Book Van is not currently adding new stops, but there is a wait list.